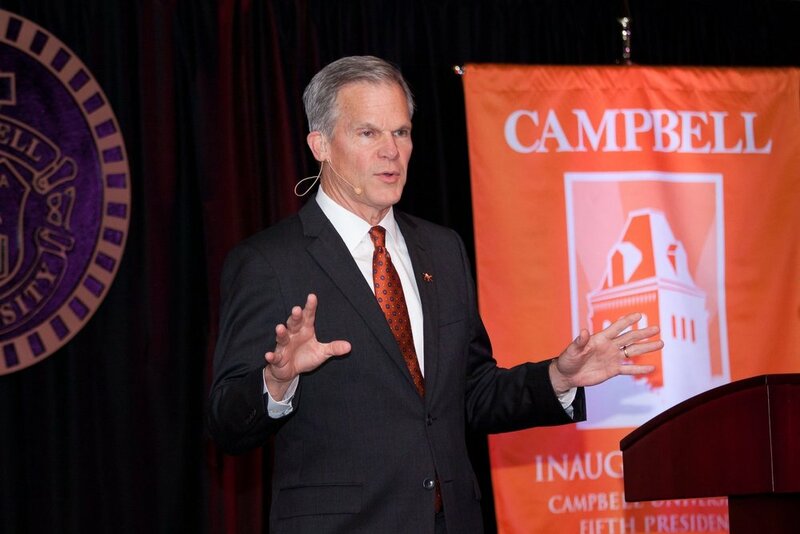 Over the 2015-16 school year, Campbell University welcomed its fifth president in 128 years. The inaugural year included a 13-stop university presidential tour designed to give the audience an identical experience regardless of venue size or location. We were tasked to create multiple events for alumni, friends and parents to meet the new president. The proposed plan was to have a reception for people to meet the new president, but we felt the event would be an amazing opportunity to engage and reintroduce our growing university. In a period of six to seven months, we held 13 events around North Carolina, Virginia and in San Diego. From the start, we wanted to give our audience a consistent experience across multiple events and locations. We wanted someone in a venue for 50 people to have the identical experience as someone in a venue for 300. Originally, I began developing a single back drop, which morphed into series of pop-up banners that could be reduced from seven to three. Ultimately, the pop up banner idea looked too much like a trade show backdrop than an “evening event” with the new president. I went back to the drawing board and identified several visual elements that could be placed in conjunction of an adjustable black backdrop that we could tailor to large and small venues. Historically, Campbell has had very large podiums, which probably rooted out of a more conservative religious background. The problem with a large podium is it places a barrier between the speaker and the audience. It makes the speaker, in our case the president, seem distant and disconnected — which is last thing we wanted to portray during the tour. So I found a narrower podium and branded it with C-A-M-P-B-E-L-L on the face in raised brushed metal. I also made sure the podium was light enough the president could easily move it if he wanted a more intimate interaction with the audience. Directly behind the podium, I had a lightweight three-dimensional university seal created, and painted a metallic, aged bronze to mirror the eight-foot seal located in the heart of campus. In the higher education industry, the seal is the university's corporate mark and is reserved for official documents and can only be used on things sanctioned by the president and board of trustees. 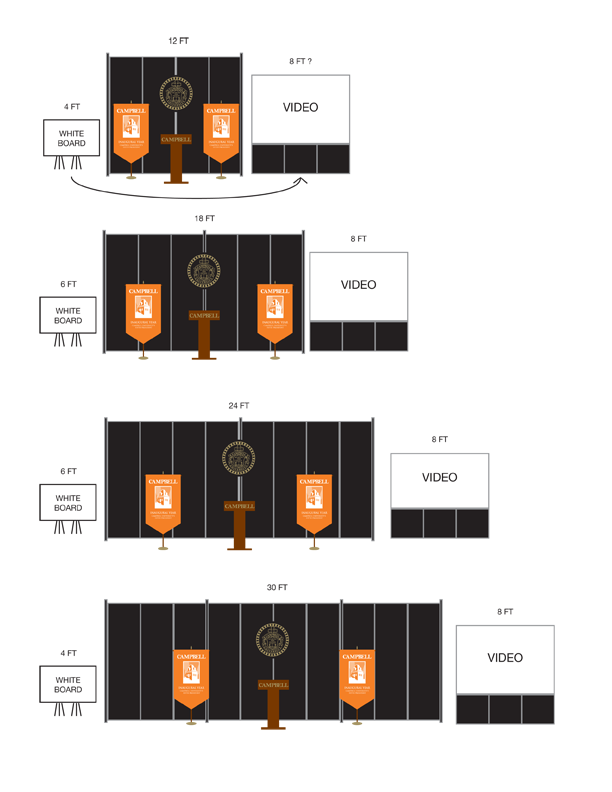 To the left and the right of the podium, I designed two Campbell orange gonfalons with the university logo and an illustration of Kivett Hall, the oldest and most recognizable building on campus — which later aided in the creation of the new university logo and visual identity. The use of gonfalons not only visually defined the borders of the stage, but also through their rich history in formal collegiate events helped reinforce Campbell’s history and legitimacy as an established university. Ground accent lights were also used to illuminate the gonfalons and provide a splash of orange on the back drop. Every venue has its own audio and visual equipment with its own sets of shortcomings, so in an effort to prevent problems, we invested in our own AV system. We had a dedicated 4 LED spot light system that allowed us to control how the stage was lit and reduce any glare issues. The sound system included elevated speakers, wireless mics and an HD projector to play a 90-second video to introduce the president and the growing university. The consistent experience didn’t stop with the program. We worked with a local florist near each venue to arrange simple yet classic white hibiscus floral arrangements for the tables. We chose a more monochromatic arrangement and backdrop to allow the univerity's brand color orange to pop on the various branded items like table tents and signage. Much of the success of the event was our sticking to a strict minute-by-minute schedule. The event needed to stay under 90 minutes. We started with an introduction followed by a brief speech from a local chapter president, alumni or student. Then we aired a 90-second introduction video before the president introduced himself and briefly talked about his dreams for Campbell. After the president spoke, he welcomed questions through a town hall-style question-and-answer session. 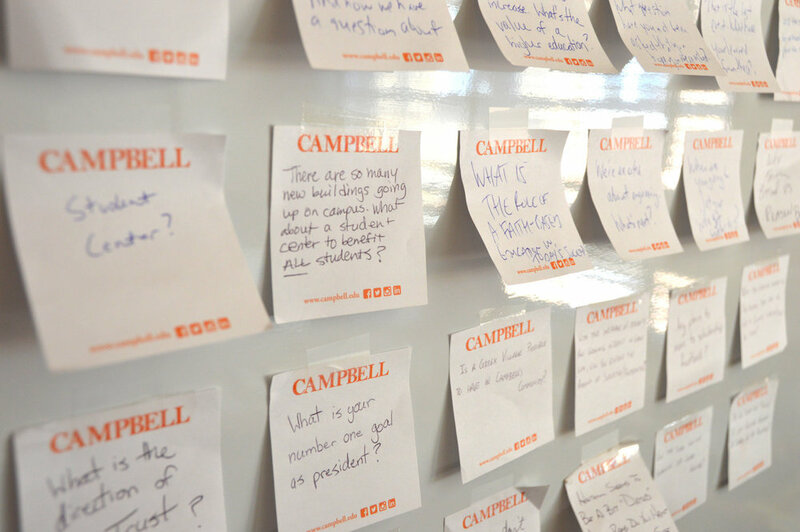 This was streamlined and controlled through allowing the attendees to write out their questions on a sticky note and put them on a branded bulletin board near the registration table when they checked in. While the president spoke, we grouped like-questions and categorized each question into sections like “athletics,” “infrastructure,” “academics,” etc. This allowed us to combine duplicates and summarize the longer questions. I worked with one of our alumni database managers to identify alumni, friends and parents in the counties and surrounding areas for each venue. Our marketing plan was broken into six touches to 13 groups of people. Six weeks prior to the event, we sent a branded “Save the Date” email which allowed us some wiggle room for a couple of the earlier events that had a tighter response date. Five weeks out, we sent a more formal invitation. In a world without a budget, I would have had developed a the full invite package with an invite, outer and inner envelope, RSVP card and a pre-addressed response envelope with a live stamp. Since our recipient list was so large, I designed shells with a gold foil seal at the top which would allow us to print 13 different invites while staying within budget. Two weeks before the event, we sent out a branded reminder about the event and how much we looked forward to seeing them. A week later, we sent out another “last day to register” email to help solidify the attendee list and confirm numbers for the food vendors. At the end of each event, the president closed out the evening thanking everyone for attending and asking them to fill out the response card they were given at check in. The card allowed the audience sign up to get involved either financially, volunteering or starting a new alumni chapter. In the end we had a response rate of about 14 percent. The day after the event, we sent a survey to help us gauge the event's success and troubleshoot any issues. The responses were overwhelmingly in support of the new president, the university and the event. As a final touch, I reproduced a handwritten thank you note from the president and sent it to each person that attended the event. All of this was scheduled and executed for 13 different groups. Though I played a large role in the planning and execution of the tour, this was very much a group effort that couldn't have been done by one person. I would credit the the success of the event on the group of people focused on collaboration and making an amazing series of events happen consistently and less on who ultimately would get credit. The tour received the Platinum Grand Award (1st) by the Council for Advancement and Support of Education District III — made up of 550 colleges and schools in the southeastern U.S. Platinum level awards automatically advance to the international level.